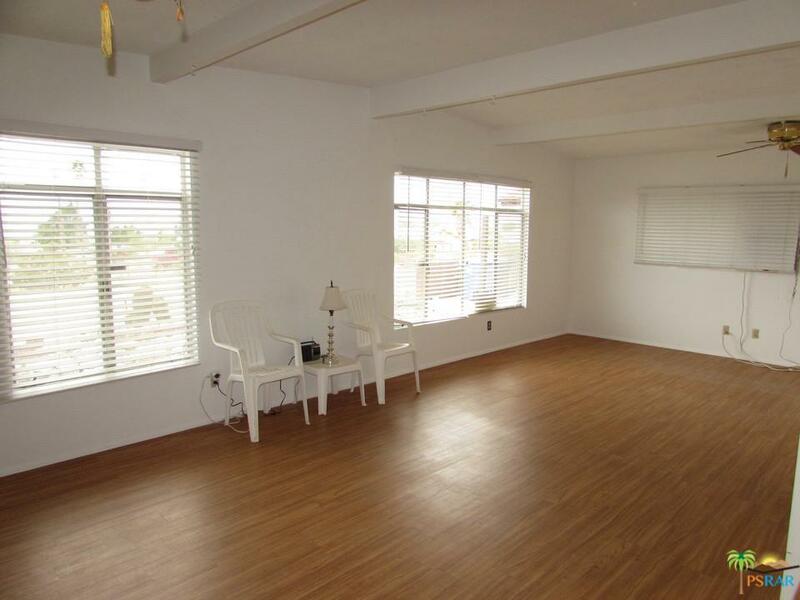 Come and see this two bedroom one bath cutie in Desert Hot Springs. County records list this home as a 1 bedroom but owners added a bonus room that functions as a second bedroom. Freshly painted inside and has newer wood-look vinyl plank flooring in the kitchen, living room and bathroom. The kitchen has plenty of storage and is highlighted by a newer gas range. The refrigerator, microwave, washer and dryer are all included! The spacious living/dining room is light and bright with gorgeous mountain views and features faux wood blinds and two ceiling fans. All rooms have window AC units to keep you cool. The bonus room (used as a 2nd bedroom) has a slider that leads to the backyard covered patio. This home is located on a large elevated lot and includes a covered tandem carport (with access to the backyard), a fully fenced generous sized yard, a covered patio, concrete walkways and two storage sheds. A great affordable starter home or rental. Come and see this little gem today!